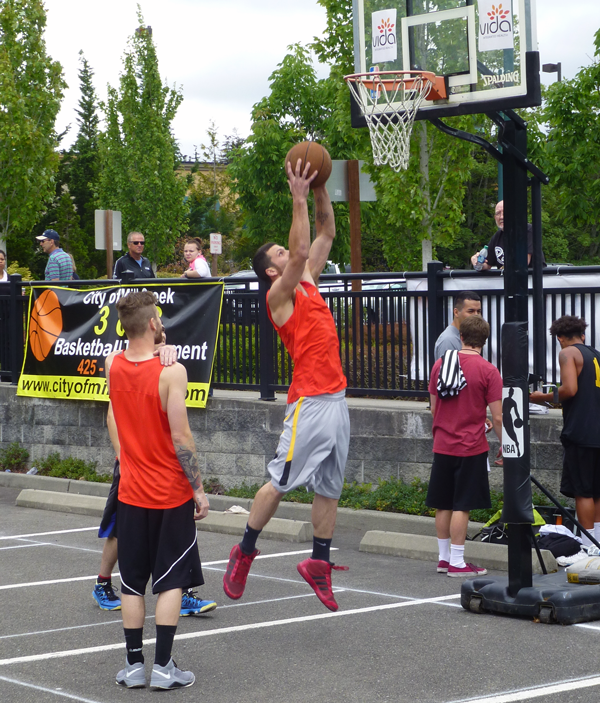 A team practices for an upcoming game at the 2014 "Main Street Madness" 3-on-3 basketball tournament. Photo credit: Richard Van Winkle. From a City of Mill Creek news release. Mill Creek Parks & Recreation is hosting the 10th annual “Main Street Madness” 3 on 3 Basketball Tournament on Saturday, July 11, 2015. The tournament will be held in the City Hall Annex parking lot, 15720 Main Street, Mill Creek. Come on out to enjoy the fierce competition. Mill Creek’s 3 on 3 Basketball Tournament is ADA accessible so that all basketball fans will be able to see the action. Teams are guaranteed three games and all participants will receive a complimentary tournament backpack and water bottle. Visit www.mainstreetmadness3on3.com for more information. Teams are guaranteed three games. Every player receives a tournament backpack and water bottle. Champion t-shirts awarded to first place team in each division. Registration Deadline: Monday, July 6, 2015 or Until Full. No refunds unless divisions are canceled. We reserve the right to combine/cancel divisions with insufficient enrollment. For registration or information on volunteering at the event, please visit www.mainstreetmadness3on3.com or contact the Parks & Recreation office at (425) 745-1891 or parksandrec@cityofmillcreek.com.